Globe Telecom spearheads the Philippines’ first digital lifestyle event to bring together the latest digital trends, gadgets, and applications that can enrich today’s mobile experience. 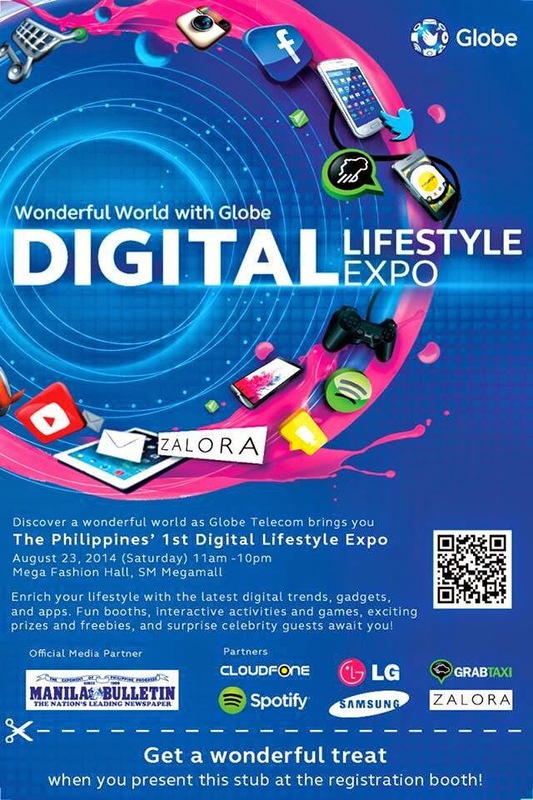 The Wonderful World with Globe: PhilippineDigital Lifestyle Expo will be held on August 22 and 23, 2014,at the Mega Fashion Hall of SM Megamall, in Ortigas, Pasig City from 11am to 9pm. Digital innovations are changing the way we live and communicate. Technology experts have seen the rise of new trends in consumer behavior as mobile device usage continues to increase. Every day, people are more drawn into living the digital lifestyle. The increased ubiquity of smartphones, tablets and similar gadgets, the birth of innovative data plans, and the abundance of various apps are shaping the way Filipinos live, communicate and connect with each other. What they download, explore, and share online define their identity and lifestyle as digital citizens. “We are very excited to be one of the frontrunners in yet another technological revolution as more users are now embracing their digital lifestyle powered by their smartphones. We would like to invite all netizens to check out the Wonderful World with Globe: Philippine Digital Lifestyle Expo and see for themselves the latest and the hottest innovations, offers, and services offered by Globe and our partners,” says Peter Bithos, Chief Operating Advisor at Globe.